Since you refuse to make a genuinely strong password as discussed in my article, “Have YOU changed your Password recently?” let’s see if we can take your existing, incredibly obvious password and make it stronger. Let’s start with the ever popular First Name and Birth Date. WALT1901 Yes, you do get partial credit for using both Letters and Numbers but fail because these are two pieces of information that many people who might want to get in to your digital accounts already know. I understand that it is very easy to remember. We can make is stronger with just a few minor improvements. Let us combine the First Name with the Birth Date so that we take one letter from the first name then one number from the birth date: WALT1901 becomes W1A9L0T1 . Almost any Password can immediately be strengthened by using LEET – substituting numbers or special characters for letters. LEET works well as a starting point. In order to throw off those who might know that you like Baseball and may use Sports Team names as your password series, we need to add a special character and mix things up a bit. If we take our LEET version of Yankees – Y@nk335 – and add an Exclamation point – Y@nk!335 – this makes the password extremely strong from a human attack and reasonably strong from an automated attack. I have demonstrated that you can hang on to your common, weak Password, so you can remember it, and apply a few simple techniques to make it significantly stronger. At the bare minimum, it is will certainly keep out noisy co-workers and family members. At best, it will make the brute force hacker’s work extremely hard to break in to your digital accounts. Understand that every password, given enough time, will be found. As discussed, someone trying to gain entry in to your digital account is going to try the easy, common passwords first. 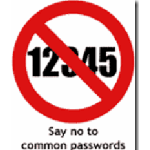 For example, “123456” is the most common password and “Password’ is the fourth most common password. A hacker is not going to have to use any fancy brute force attack to break in to an account with either of these two passwords. In fact, they will be the first and fourth passwords that the hacker tries to use to gain entry in to your account. The point is that any hacker will have a list of well know common passwords that include Sports Teams, Movies, Celebrities, Comic Book Characters, Seasons, Fictional Characters, Playwrights, Composers, etc. All of these well know possible passwords will be tried first and in too many cases, will be successful. Once you start to use Passwords that are not common and have the above techniques applied to them, you will force the hacker to use a “brute force” method of attack which can take an incredible amount of time to succeed. Thieves like to take the cars with the doors left unlocked and the keys in the ignition. Make sure to lock your digital accounts with a good quality password. The sites below have a combination of Password Quality Meters and the theoretical amount of time it would take for a brute force, automated attack to succeed. NOTE: There are significant differences in the assumptions used to determine the difficulty level in cracking your Password. DO NOT RELY SOLELY ON THESE TOOLS FOR GUIDANCE WITHOUT UNDERSTANDING THEIR METHODOLOGIES! The three sites below take entirely different approaches to determining the quality of a Password.